In a world that so often tries to equate short films with sizzle reels and project portfolios, Emily Avila is proving that short films can and should be made on their own terms. Ever since the native Australian attended Brisbane’s Queensland University of Technology for film studies, she’s had the unique conviction that short films deserved great attention and intention. After jumping around both the film industry and the world of academia in various capacities, she finally found herself in the right place at the right time to make her first short film, In A Cane Field. This Vimeo Staff Pick (with 40K + views and counting) adapts a modern short story to unravel a mysterious murder of a teenage girl deep in the sugar cane fields. This beautifully-shot (Super 16) and contemplative short picked up several awards and created the proper momentum to lead to her second and most recent short, Fitting. 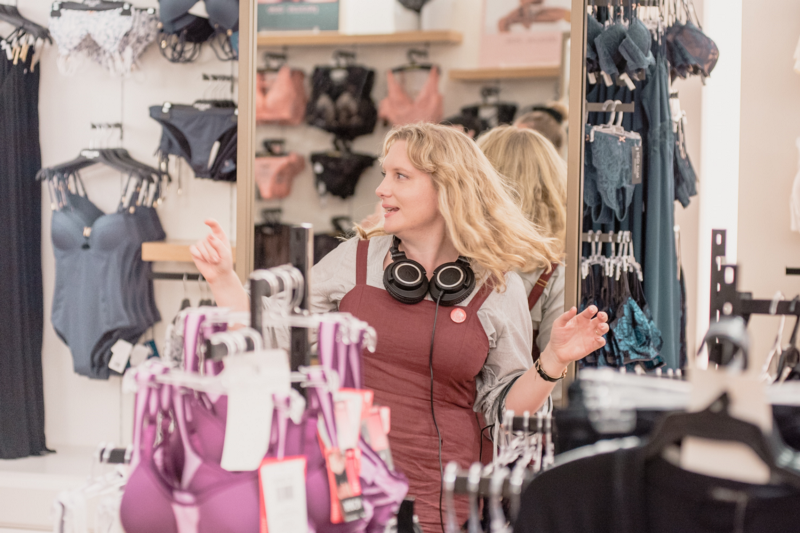 It tells the story of a woman having a strange but life-changing encounter with her bra fitter and was funded by the 2017 Lexus Australia Short Film Fellowship Avila received. Collaborating once again with cinematographer Adric Watson, this 2018 Sydney Film Festival premiere was shot on film in a 4:3 ratio, just one in a string of strong, motivated choices by this special duo. Fitting has since gone on to premiere at several more festivals, including this year’s Palm Springs Short Film Festival, where we first heard about it. When not making movies herself, Avila can be found taking part in short film festivals far and wide, including her recurring role as the artistic director of the Heart of Gold International Short Film Festival (runs October 4–7, 2018). Miniflix had the chance to talk with Emily Avila about film school culture, several behind the scenes stories from both short films, and encouraging advice for aspiring short filmmakers today. Miniflix Interviewer: You attended Queensland University of Technology in Brisbane for your undergraduate and eventual postgraduate work. Did you feel that the film program at Queensland put much emphasis on the teaching of short films as a form distinct from feature films? Did university foster much sense of a short film culture? Emily Avila: Even though we were making short films, there wasn’t much being taught about short filmmaking per se…or short films as an art in itself… As happens in film studies, you’re taught how to make feature films and then you end up making short films. And I think that’s a problematic approach. I don’t think that film courses necessarily left me with any insights into approaching short films. If anything, most of the places where I feel inspired about short filmmaking come from other avenues, whether it’s art…or from music videos or a short story. Often I feel like short filmmaking is treated as a proof of concept for something bigger, when what it could be is actually something powerful in and of itself… Watching so many short films as a programmer has helped me a lot. Miniflix: I noticed you’ve had a long and successful career with film festivals, including your most recent position as an artistic director of the Heart of Gold International Short Film Festival. What do you like most about working behind the scenes for film festivals? Emily: I think film festivals are really important for communities. And what I like about Heart of Gold is that it takes place in a regional setting in a town that doesn’t have as much of a thriving arts community as a capital city like Sydney or Melbourne. Because it happens in this regional setting, you get an audience who aren’t your typical film festival audience. You’re getting such honest responses to the films and actually really unexpected responses as well. I think that people might be quick to assume that a film that’s slightly unconventional in form…a kind of slow cinema…is not going to appeal to this group of dairy farmers and retired school teachers. But I’ve had just the opposite responses. And with a short film festival I can program over 120 different films….so that becomes 120 little portals into other worlds and experiences for this audience. M: Your first short film In A Cane Field was adapted from a short story called “The Serrambi Case” written by Frances Des Pontes Peebles. It originally appeared as a published story in Zoetrope: All Story. Is that where you found it, or how did it cross your path? E: I was given an issue of Zoetrope: All Story by a friend as a present. It probably sat on my coffee table for a couple of months and then I picked it up one day and I started reading Frances’ story. I immediately felt a personal connection with it…the way that Frances depicted the emotional turmoil of each character, and the way those emotional responses and shocks in the aftermath of grief all sort of rubbed up against each other, and were all clashing and were very different from each other. 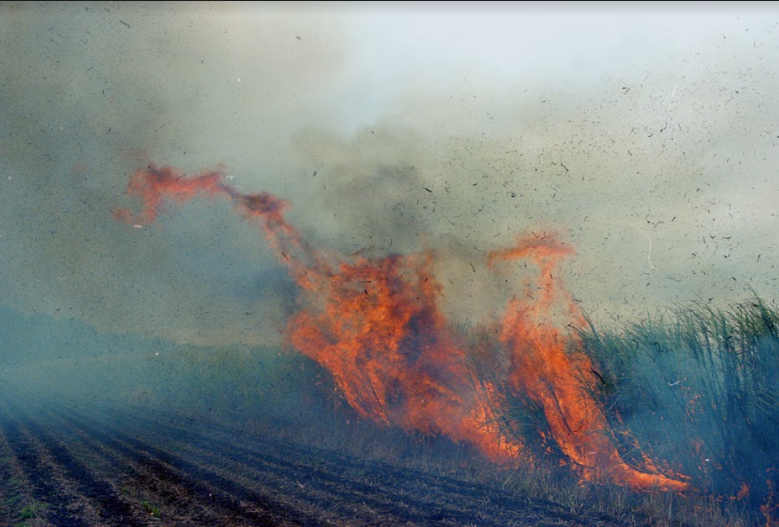 M: Describe what it was like shooting the burning of the sugar cane fields. The landscape would look different each time we visited. The cane fields are in the cradle of an ancient volcano and prone to stormy weather due to the surrounding mountains and closeness to the ocean. We started to amass all this content that we had — photos and musings and versions of the script — and we learned that they only burn off the cane once a year. We didn’t yet have financing for this film and we weren’t ready to shoot the whole film, but we knew that we needed to shoot these fires, because we were planning on making the film within the year. So we self-financed what we could, got some rolls of 16mm, Adric bought the camera, and then we just went and shot the cane fires documentary style. I thought that once the cane got burning that it would last for ages and that we’d have plenty of time to shoot, but as soon as they light it, it just rips through the fields…so we were having to run with the 16mm camera across this field with boxes of lenses and things…because once they burn the field, that’s it. No more takes. Yet, in your film I sense a complicated relationship with facts themselves and their supposed consolation. Ironically enough though, the film starts out like it’s going to be a conventional crime drama. This is especially evident in your use of procedural iconography: the examiner suits, the photographs being taken of the dead body, etc. In the end though, In A Cane Field subverts that premise by using fragmented voiceover segments from several different points of view. How much of what we see in the final edit, especially in terms of structure and the layering of different perspectives, was in the original screenplay you wrote? Were shot selections mostly pre-planned or fairly intuitive, like in the cane burning sequence? E: It was very pre-meditated. That fluidity between scenes where you feel like you’re being pulled through was very important to me when writing the screenplay. I wanted those transitions written in. It even came down to the colors… I had an intentional cycle of colors in the film. If you got a frame from each scene, and laid them next to each other, you’d see a progression that starts very cool and eventually works its way to fire. There’s this idea of ripples in the film as well. If we imagine Maya as the stone thrown into the pool, what does the outer ripple look like? How does everyone’s proximity to her change their experience of what happened, and in turn the audience’s encounter with them in the film? This was all a clear methodology for me to approach the film…but in the end, I was hoping the story was something that could be felt more than anything. Something that you weren’t quite conscious of. Maya creates literal and figurative ripples in the lives of those around her. But this all came from Frances’ short story as well. The subverting of that genre is a big part of what attracted me to the story in the first place. The fact that by the end you don’t have an answer. What you have instead is a problem that got even bigger and an experience that got even bigger. By using the structure of that genre, I felt that you would be able to pull people into it, and then the subversion at the end would truly be felt. The voiceovers were also all in the script already, but we eventually did pick and choose which ones to use in the edit. It’s still very, very close the original shooting script, but there are moments when the fluidity took over in the edit. For example, the parallel cutting between the mother entering Maya’s bedroom with Maya from an earlier point in time getting ready. They were originally scenes that were meant to be separate, but we decided to intercut them. In A Cane Field opens with all the makings of a classic procedural film. M: Well, I definitely agree that the cinematic journey always has to be felt for it to really have an impact. How was In A Cane Field received when you started screening it places? E: It’s a weird one in a way. It’s a film you have to be in the mood to receive. And I actually think it’s best watched when you’re by yourself, earphones in. Not in a cinema. It’s an introspective film in that way… You know, it’s hard to really say because so many of the screenings I’ve had included so many audience members I knew personally. So you won’t get that proper, unbiased read. The most real responses I’ve had come independently, from those who have just come across it. And I think coming at it by one’s self has allowed many people to sink into the world of it. M: I heard that you’re considering a feature length version of In A Cane Field. How’s that going? E: Well, the short story is in itself so much bigger, and I still feel like there’s so much more I want to tap into. There’s more stories to include that weren’t in the short film. There were characters I couldn’t include. With the original story being based in Brazil, there were all of these layers about class and racial discrimination that I would love to keep exploring. 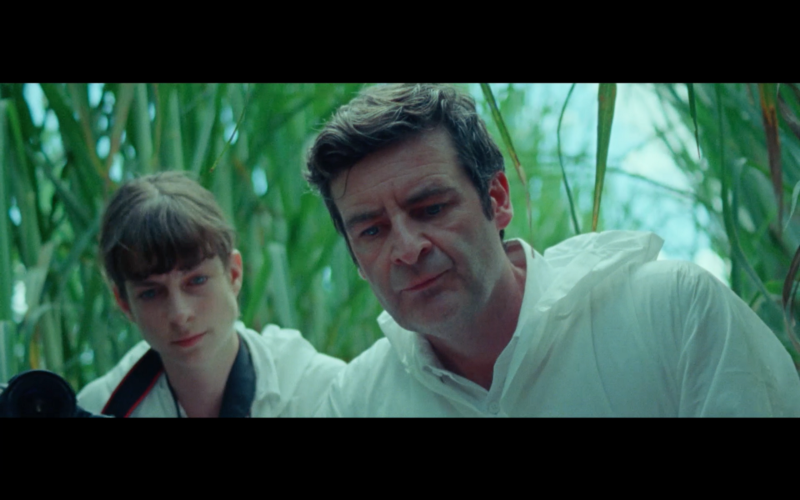 M: I will say that the poetic flow of In A Cane Field fits the short film medium so well, that I’m a little curious how you plan on staying true to the tone and vision of the original without losing its sense of energy and pacing. Is that a major concern of yours, or something you are wrestling with? E: I think that lightness in which each character is treated in the short film version is why it has the momentum it does. The feature would have to really dive into these stories a bit more and you’d have to flesh out those characters and their worlds a bit more. I’ve toyed with whether a TV series would be a better approach…but the reason I want to make it into a feature is because I want all those perspectives to be contained from the one and be pulled through each story. I wouldn’t want to lose that poetic flow you’re talking about, but I would want to expand the scenes. 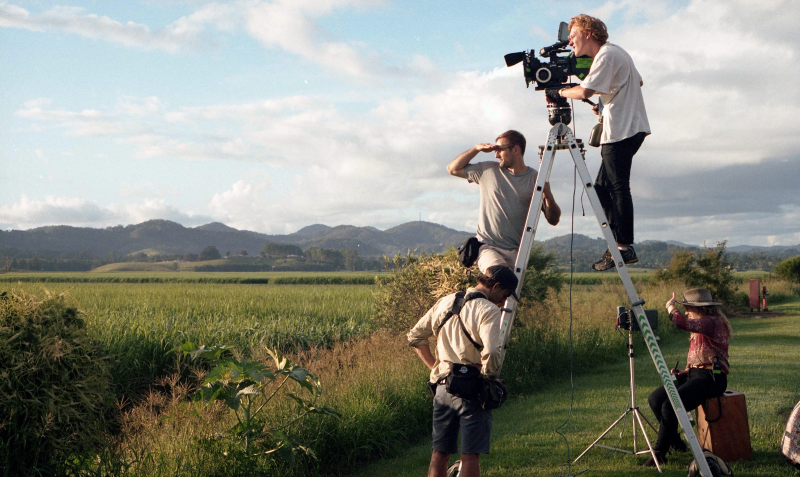 M: I noticed some overlap in stylistic choices between Fitting, your latest short film, and In A Cane Field. While I would say Fitting is a more naturalistic and less impressionistic film than In A Cane Field, I did find it intriguing how you and your sound designer/mixer Dylan Barfield bring sound effects into a scene that we are about to witness but aren’t seeing yet. In particular, these eventual scenes turn out to be flashbacks or flashforwards from the main chronology of the movie. The choices there felt very reminiscent of In A Cane Field because of that organic, flowing sense. It’s a very effective tool because it compresses the time element, but it also brought to mind the fluid pace of your first film. Are these transitions coming to you before you put pen to paper, or are they discovered in collaboration with Barfield and Adric Watson? E: Both, I guess. There were actually going to be more of those moments, but once we got into post-production, I decided against it. I never want a flashback to just feel like a flashback, or feel jarring. I want the entire sequence to feel of one moment. I want there to be fluidity between, for example, the shower and hospital and the fitting room. So that was written into the script. But it’s very important to me that they are just moments and that we are not dragging into another whole scene. M: Let’s consider the perspective of an aspiring short filmmaker watching your movies for a moment. Let’s say they were watching In A Cane Field and Fitting back-to-back. From a production angle, I think the assumption might be that Fitting was a lot easier and simpler to make. The settings are more contained and the setups look simpler from first glance. Is it actually the case that Fitting was an easier film to make, or perhaps had a smoother production? E: With Fitting, I wanted the challenge of a contained space. I purposely gave myself the limitation of setting the entire story essentially in a fitting room. I’d just made In A Cane Field, where I was running around with so many characters and stuff going on everywhere. So this time I just wanted two characters with no real options for cutaways: no ways out. That was a very conscious exercise for myself.But what I learned was that it doesn’t matter how many restrictions you put on yourself…it’s still going to have all of these new problems. It’s not going to be end up any simpler or straightforward, ever. M: What new challenges in particular came your way when making Fitting? E: Well, with Fitting I was wanting to do something a little more classical in structure…it was hard because I took away so many of the stimulants I had had with In A Cane Field. I really love the environment of that film, but it could have gone on endlessly… Whereas, in Fitting, I was just completely limited by the space. I mean, there was even a mirror in the room, it was very hard to find new angles in there. Not only that, but our lead actress Deborah [Leiser-Moore] had actually had a single mastectomy and a reconstruction…so we had to use VFX to re-create the scar. Her chest is bare for most of the film so we had to work around it. Plus, there’s a mirror. Plus, you’re already in a tiny room and the whole film’s set in there. One night, Adric and I finished shooting with 30 to 45 minutes to spare and the first AD asked if we wanted to get anything else while we were there. Adric and I just looked at each other, thinking “What else could we possibly get?” I mean, that’s never happened, there’s always more we can find to shoot…. So it was a totally different experience but still hard on the brain. M: How many days of shooting did you have? E: Four days. They were all night shoots. M: How did you and Adric come to a shared understanding on the visual style of Fitting? E: At the start, when I was writing Fitting, I had these photos from the photographer Cristina Coral, an Italian photographer. It was this series called Inside/Outside and it’s all about a contained interior world versus what you actually show to the outside world. The photographs are very lush and very pink, like a dusty velvet pink. Very feminine. Very quiet. Kind of still and secretive, like you’re peeking into this private thing. I really wanted the film to see women the way they see themselves, not the way they show themselves. And I wanted it to all be set in a fitting room, because I’ve worked in retail…and far from being just a place of superficiality, I find fitting rooms to actually be a site of transformation where you’re toying with different ideas of yourself, and where change is possible. Where you’re actually really confronted by yourself. It’s an incredibly vulnerable place. The idea of inviting audiences into that very private world, like what happens in a bra fitting, felt very charged. And so I wanted the film to have that sense of a very contained space where the audience’s proximity is very similar to that. Adric’s suggestion of the 4:3 ratio was perfect for that. M: Yes, it was a brilliant move. E: And I wanted the palette to be very intentionally pinks and purples and what you’d traditionally associate with feminine. For the film to look and feel like skin, for the texture to be tactile. That was the starting point. M: There are moments when I felt as if I was watching a period drama or a costume drama. The setting is completely contemporary, but you still get transported into this other world. There’s a very sharp contrast between the front of the store and the fitting room itself. The front is very contemporary, but once we step behind the curtain it’s like we’ve entered another time. E: There is sense in which everything before [the fitting room] could be thrown away. There’s actually a version without all of the lead up. But I did want you to start to having questions about this character…I think you needed to see her with her guard fully up first as well. M: So you actually wrote this script with another writer. E: Yes, I wrote it with Brisbane writer, Bronwen Noakes. She’s wonderful. She’s someone I met when doing script development. She’s incredibly sensitive. And I wanted to collaborate with someone in the writing phase. We work together really well. And she actually worked as a bra fitter in a past life, so she had a little expertise to offer too. M: Did any specific films influence you as you were making Fitting? M: A lot of the film’s emotional impact for me came from the eyes and gestures of the two leads Deborah Leiser-Moore and Clementine Anderson. Besides the edits and sound cues you used, I feel that it’s their bodies telling the story. How are you, as a director, communicating the importance of eye gestures and small movements like these to your actors, if it all? E: Both of the actresses actually have a theatre background. This was actually Clementine’s first film. Deborah has a physical theatre background…so telling stories with her body is a big part of her practice as an artist. That was one of the reasons I wanted to work with her. This really was a story about proximity and body language as much as it was about anything else. In terms of directing that performance, it was actually quite choreographed. It had to be. The dimensions of the space and the fact that they couldn’t stray far from their marks made it necessary. What was interesting to me was that it was a charged space. Deborah was half dressed for a lot of the time and we were actually in a fitting room…so that conversation between the two characters is happening naturally between their bodies. M: How would you go about encouraging filmmakers who do want to make short films but live or work in an environment where short films are not encouraged or treated seriously as an art form? E: Because short films can be online and go as many places as a feature now, there’s no reason anymore to think of short films as something that will be less inhibited. But more than that…if you are making it for artistic reasons, it doesn’t really matter how long it is. The size of the canvas doesn’t dictate the worth. With short film, there’s actually more potential, because, in a way, with smaller budgets and less interested parties who want to make it into a certain thing, there’s more room for experimentation and for dealing with subject matter that is personal. M: What’s one of your favorite short films, and why? E: A Gentle Night by Qui Yang. It’s a Chinese film that was at Cannes last year. It’s about a woman looking for her daughter who’s gone missing one night in China. It’s a film where you can tell the director understands all of the tools he has in his kit and really exercises restraint. A lot of short films involve the filmmaker throwing everything at it….but I love it when a filmmaker has a sophisticated understanding of how little you need in order to have a strong impact. Qiu Yang orchestrates the film in a whole way, where you can feel the progression of the film as a whole through the sound design and through the cinematography, all perfectly aligned with the narrative pace and performance. It’s a very taut and emotional film.